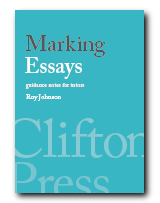 Marking Essays offers advice, guidance notes, and support materials for tutors who mark and grade student essays. Suitable for use in schools, colleges, and universities. All the common issues of assessment, grading, writing support, and offering written comments for improvement are clearly explained. 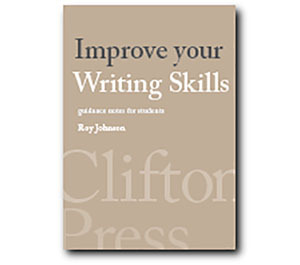 Features sample marked essays, plus practical advice from experienced tutors. Common grading schemes are explained. and suggestions for using IT solutions. The PDF format can be used on laptops, mobiles, and workstations. It deals with all the most important questions of assessing and responding to academic writing. You can add your own notes and live hyperlinks to personalise your eBook and make it even more interactive. Marking strategies The right tone. The importance of rapid turnaround. The basic requirements of a successful essay. Script comments What to write on the essay – and how to write it. Correcting mistakes. How much comment? General advice The ‘sandwich’ technique. Encouragement – critical engagement – suggestions for improvement. Guidance notes Examples of templates for guidance note to deal with common problems – which save time and effort. Structure Introductions – the body of the argument – conclusions. The importance of the paragraph in creating structure. Assessment Examples of grading systems – and how to interpret them. Making allowances. Technical solutions Templates for support materials. Audio-cassettes. Computer macros.